Welcome to the Ultrasound Leadership Academy (ULA) summary blog series. This week, we discuss ultrasound in early pregnancy. The ULA is essentially an online advanced ultrasound education experience put on by the team from Ultrasound Podcast which brings cutting edge learning to emergency medicine personnel through a variety of interactive platforms including video lectures, google hangouts with experts, simulation, live conferences and real time scanning with a pocket-sized ultrasound device known as a Vscan. Prior to reading this post, I suggest you review our previous post "The Basics of Pelvic Transabdominal Ultrasound" (including resource links at the bottom of the page) if you are not familiar with the basics of pelvic ultrasound and relevant anatomy. The female patient arriving to your emergency department with an positive pregnancy test, vaginal bleeding and vague abdominal pain is something we see all too often. The dreaded word ectopic runs through your head and while uncommon, it is something you cannot miss. Following a structured approach to working up these patients is important and learning to incorporate ultrasound and understand the meaning of the quantitative bHCG is critical to the decisions you will be making. Looking at some of the recent literature, as emergency physicians we are excellent at identifying normal intrauterine pregnancies via bedside ultrasound and our sensitivity approaches near 100%. For those who are just getting started in ultrasound evaluation in pregnancy, it appears that the magic number of scans required to reach this sensitivity is ~ 40 scans. That being said, once you have surpassed this number of scans you should begin to feel confident about your confirmation of an intrauterine pregnancy and not have to order the radiology formal study. Bedside ultrasound for pregnancy will not only decrease your patient's length of stay (studies found decrease in LOS by more than 1 hour) but it will also save money. Lastly, don't forget that early pregnancy and its complications are always full of difficult conversations and emotional distress by the patient and family. You will need to be prepared for these difficult conversations and it is useful to know what evidence we have to tell patients regarding the status of their pregnancy. A recent study published by Mallin et al, looking at bedside ultrasound in early pregnancy in the emergency department, found that patients who had documented fetal heart tones on ultrasound had a spontaneous abortion rate of approximately 14.8%. Meaning we can be reassured and while letting the patient know about this risk, we can tell them that it is likely they will have a normal pregnancy. Remember from our previous post the anatomy of the pelvis. The uterus is posterior to the bladder and can have different positions depending on its version and flexion. 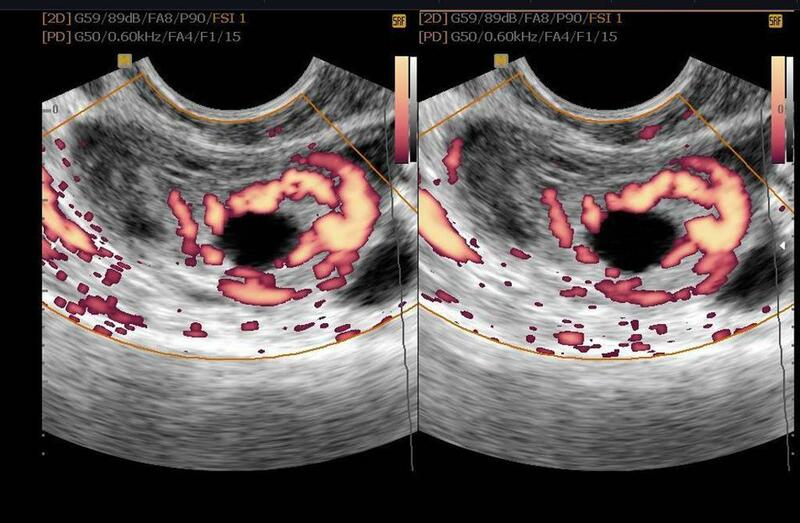 You will need to be evaluating the entire uterus and adnexa, as well as the spaces both anterior to the uterus as well as posterior (the pouch of Douglas) to look for concerning free fluid. Your technique will vary slightly depending on whether you are performing a transabdominal scan versus a transvaginal scan. Trans-abdominal: This approach will be more useful for late 1st trimester and 2nd trimester. Remember your bladder is the acoustic window here so a full bladder will allow much better visualization of uterus and pelvic structures. 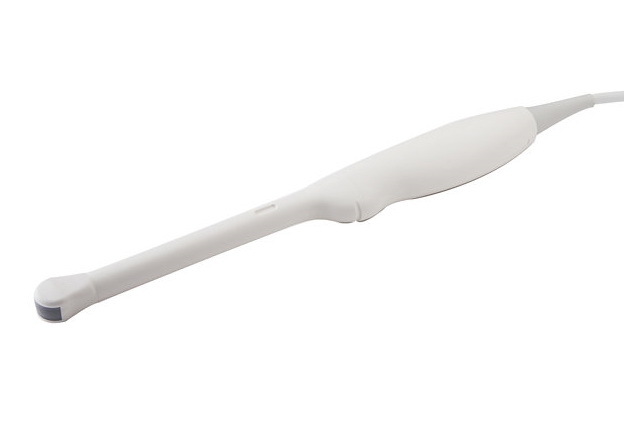 You will be using a curvilinear probe (low frequency) probe which allows for deep penetration of the tissue. Bowel gas will often be a hinderance to your exam so constant, firm pressure will be useful in displacing bowel and obtaining better images. You will be obtaining both transverse and sagittal cuts. Review this technique here from our previous post. Trans-vaginal: This approach will be more useful in early first trimester pregnancy (~5-9 weeks) as it lies closer to structures of interest and uses a higher frequency probe for better image resolution. The cervix will act as acoustic window here and an empty bladder is essential for this scan. You will be using an endocavitary high frequency probe for this approach. A protective barrier is required over the probe here and a condom, glove or commercial probe cover can be used. You will be performing this exam simultaneously with the pelvic exam in the lithotomy position. Initially, the trans-vaginal approach may seem confusing, making it difficult to interpret where you are in space and what you are looking at. To lessen the confusion, let's briefly talk about the endocavitary probe. It may appear to you almost like a storm trooper laser blaster at first. You will be holding it at the handle with your fingers underneath, your index finger wrapped around the trigger area. Your thumb will then be lying directly over the probe marker which you will always have pointing either towards the ceiling or to the patient's right side. Note the elongated tip of the probe with crystals at the distal tip. The endocavitary probe has a field of view of around ~145 degrees which is a much wider view than other common probes. Just as in the trans-abdominal approach, you will be obtaining both long axis (sagittal) views of the uterus and short axis (transverse) views. Sagittal views will be obtained with the probe marker towards the ceiling. Once you identify the uterus in long axis, be sure to pan to the patient's right and left (staying in the same plane) to examine the entire uterus, looking posteriorly and anteriorly for any free fluid. You can then rotate the probe 90 degrees to the patient's right to obtain a short axis view, and scan up and down through the entire uterus from cervix to fundus. 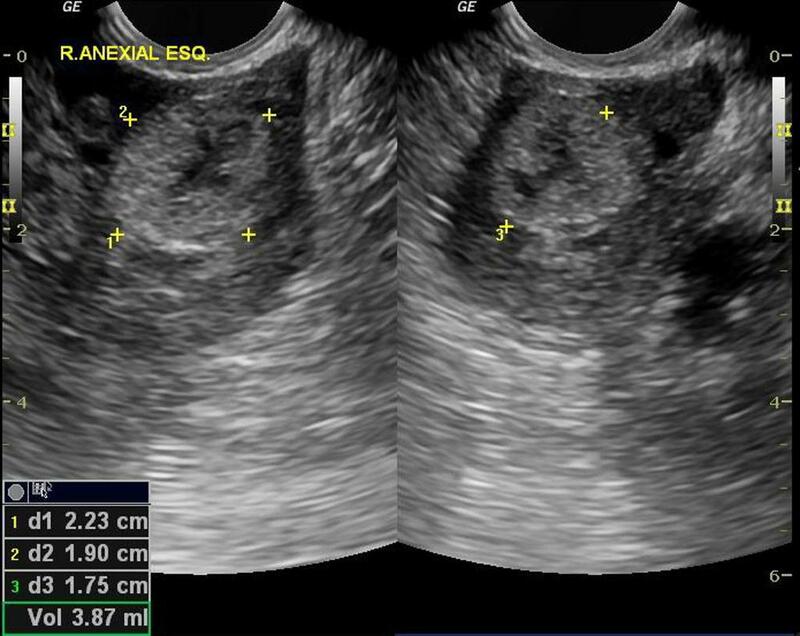 You can also identify the ovaries in either long or short axis view (slightly hypoechoic compared to uterus) which will have a "chocolate chip cookie" appearance due to ovarian follicles and are typically found around the body of the uterus, anterior and medial to the internal iliac vessels (though not always). 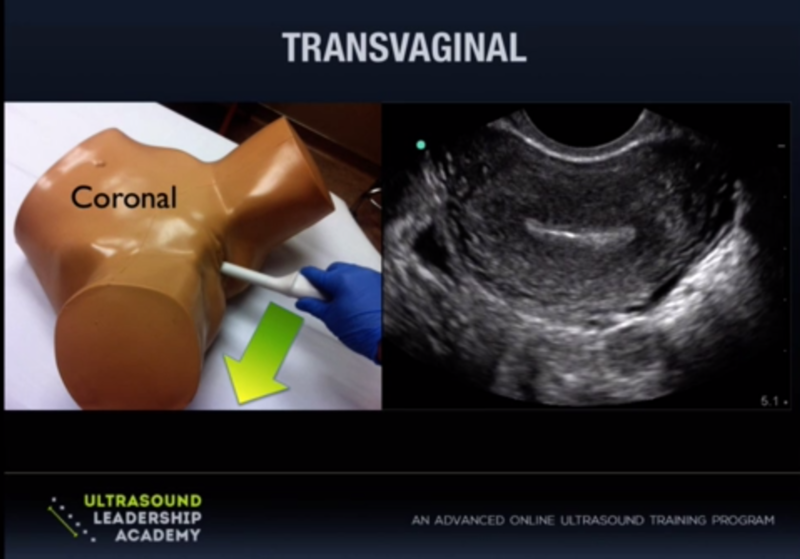 One minute tutorial on trans-abdominal ultrasound to confirm IUP. From UltrasoundPodcast. One minute tutorial on trans-vaginal ultrasound to confirm IUP. From UltrasoundPodcast. If you have identified a yolk sac or fetal pole you have confirmed an IUP. If you do see a fetal pole,next you can assess for fetal heart tones. You are looking for a twinkle or twitch within the fetal pole that represents the heart beat. Using M-mode, place the line of interest over this structure. In M-mode, you will be looking at what is occurring along this line of interest over time (seconds). So if something is moving(the heart beat) you will be able to see that area moving up and down. You will then be able to measure from peak to peak or trough to trough to calculate the heart rate. You probably should avoid using pulsed wave doppler as there is a theoretical risk to the fetus since this mode uses more power per time unit. So you know how to perform a pelvic ultrasound but how do you incorporate it into your practice and how do you use it to make clinical decisions. Mike & Matt from the Ultrasound Leadership Academy have come up with an excellent algorithm to assist with decision making which we will discuss further below. Previously, we used to rely heavily on bHCG level and something known as the discriminatory zone. The discriminatory zone theoretically represents a specific level of bHCG at which an IUP should be visible. If the bHCG was in this range and an IUP was not seen then the patient required a work up and OB consult to rule out an ectopic. A recent study performed by Wang et al, looking at early pregnancy patients presenting to the ED, found that using the discriminatory zone to differentiate intrauterine from ectopic pregnancy without a visible IUP was not helpful. That doesn't mean we are not ordering bHCG levels on patients, instead we are relying less on this test for decision making and more for follow up. The algorithm is just as simple as it looks. If you see a yolk sac or fetal pole, your done. If you have no definitive IUP on ultrasound (including trans-vaginal) and dates by LMP are early, then close follow up is warranted with repeat US and bHCG. No IUP and concerning dates, these need OB consult and formal ultrasound. We know it's not always this clear cut so make sure you are using clinical judgement, any free fluid in the abdomen, pain out of proportion or other concerning symptoms should lead you to investigate further. Blighted Ovum: Essentially an empty gestational sac without evidence of fetal pole or yolk sac. If the gestational sac is > 20 mm without evidence of fetal pole or yolk sac then this can be considered a failed pregnancy. Pseudogestational Sac: This represents a decidual reaction of the endometrium from stimulation by bHCG. While this can sometimes be seen in ectopic pregnancy (~10-20% of ectopics), it does not have great predictive value. Usually the sac will be < 10 mm in size. Subchorionic Hemorrhage: This is the most common abnormal finding in an IUP. It bodes a worsened prognosis for the woman ( ~ 20% risk of miscarriage) if symptomatic. Small, asymptomatic sub chorionic hemorrhages do not worsen the prognosis. Molar Pregnancy: Also known as gestational trophoblastic disease, incidence ranging from 1 in every 1000-2000 pregnancies. Absence or presence of a fetus distinguishes complete mole from a partial mole. Ultrasound findings are quite variable but the most common appearance is a solid collection of echoes with numerous small anechoic spaces (bunch of grapes). As you can see above, the majority of ectopic pregnancies will be tubal in location, specifically in the ampulla. Most of these ectopic pregnancies will not able to be directly visualized so you will often be looking for other findings to increase the likelihood of this diagnosis. 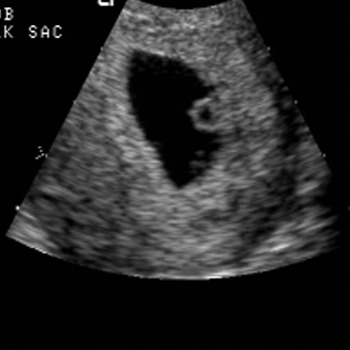 If you do suspect an ectopic pregnancy, always be sure to perform a FAST scan (make sure patient is flat), specifically looking at Morison's Pouch in the right upper quadrant. Free fluid in the RUQ is a very strong predictor of need for surgical intervention with a positive likelihood ratio of 112. Lastly don't miss the abnormal intrauterine pregnancy. Remember when you are confirming an intrauterine pregnancy, you need to be sure that it is in the proper portion of the uterus. From Doane et al. Emergency Ultrasound Identification of a Cornual Ectopic Pregnancy. 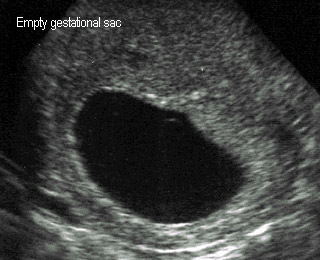 Interstitial Pregnancy: Note the eccentric location of this gestational sac and the thin portion of endo-myometrium (EMM) surrounding it at the superior aspect. A EMM width between < 5-7 mm should concern you for interstitial ectopic pregnancy which is at risk for uterine rupture and hemorrhage. This measurement should be taken at the thinnest portion surrounding the gestational sac. Read this case here. From Chrestiana et al. 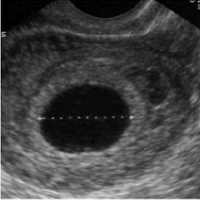 Pitfalls in cervical ectopic pregnancy diagnosis by emergency physician using bedside ultrasonography. 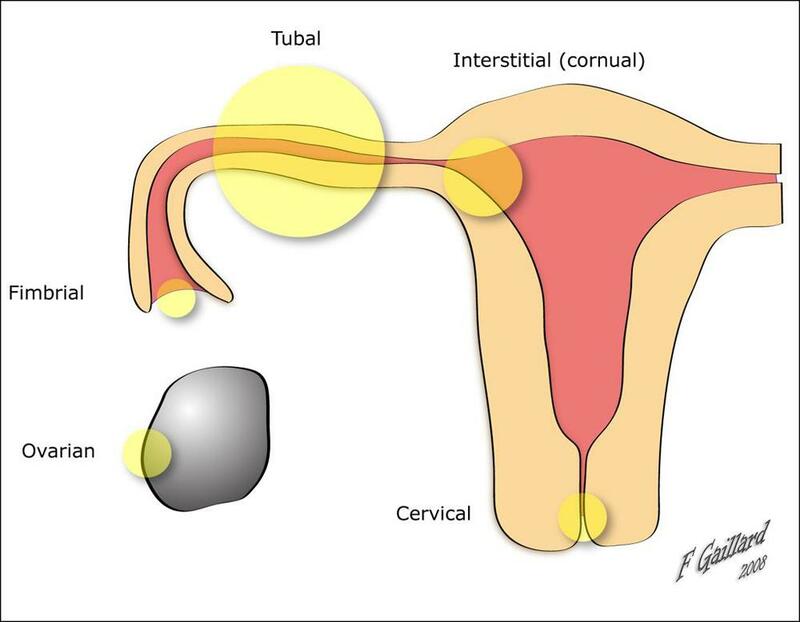 Cervical Pregnancy: Rarely, implantation of the embryo can occur in the endocervical canal. These are at risk for severe hemorrhage and if ruptured are more likely to require emergent hysterectomy. Look for an IUP in the cervical canal with a normal endometrial stripe. You also may see an hourglass-shaped uterus with a ballooned cervical canal. Read this case here. All images are courtesy of the ULA online video course unless otherwise stated. More on ultrasound in pregnancy can be found in "Introduction to Bedside Ultrasound," Volume 1 & 2, from Dr. Mallin and Dr. Dawson. If you are interested in purchasing these ebooks for less than $1, visit Ultrasound Podcast Consumables. Stein et al. Emergency physician ultrasonography for evaluating patients at risk for ectopic pregnancy: a meta-analysis. Ann Emerg Med. 2010 Dec;56(6):674-83. Jang et al. Learning curve of emergency physicians using emergency bedside sonography for symptomatic first-trimester pregnancy. J Ultrasound Med. 2010 Oct;29(10):1423-8. Blaivas et al. Do emergency physicians save time when locating a live intrauterine pregnancy with bedside ultrasonography? Acad Emerg Med. 2000 Sep;7(9):988-93. Moore et al. 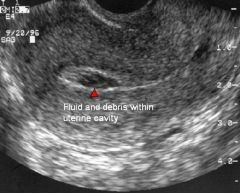 Free fluid in Morison's pouch on bedside ultrasound predicts need for operative intervention in suspected ectopic pregnancy. Acad Emerg Med. 2007 Aug;14(8):755-8. Epub 2007 Jun 6. Mallin et al. 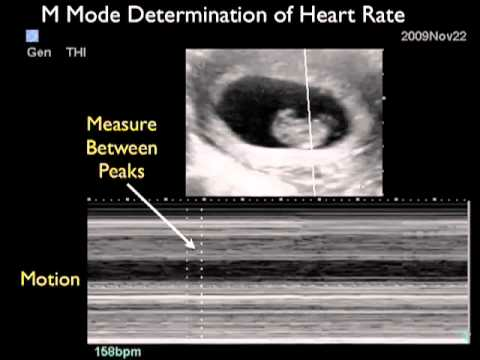 Prospective outcomes of pregnant ED patients with documented fetal cardiac activity on ultrasound. Am J Emerg Med. 2012 Mar;30(3):472-5. Wang et al. Use of a β-hCG discriminatory zone with bedside pelvic ultrasonography. Ann Emerg Med. 2011 Jul;58(1):12-20. Doane et al. Emergency Ultrasound Identification of a Cornual Ectopic Pregnancy. Western Journal of Emerg Med 2012 Sep;13(4): 315. Dewi et al. Pitfalls in cervical ectopic pregnancy diagnosis by emergency physicians using bedside ultrasonography. American Journal of Emergency Medicine 2014, 32 (4): 397.